Located on Mt Maunganui's golden mile - Marine Parade. This recently refurbished 2 bedroom holiday home has everything you need for your perfect getaway. Whether it's a couple's escape or family fun, this place has it all. To top it all off one of the best beaches in the country is across the road. Enjoy falling asleep and waking up to the sound of the waves crashing on the beach. Supermarket is in walking distance and cafes a short stroll away. No unaccompanied teenagers, owner has flat upstairs. Families/ professional couples and singles preferred. $300 bond is required, refunded upon final inspection. Loved the location on the beach. Apartment was well equipped and perfect for a couple. Microwave broke and was replaced in a day. 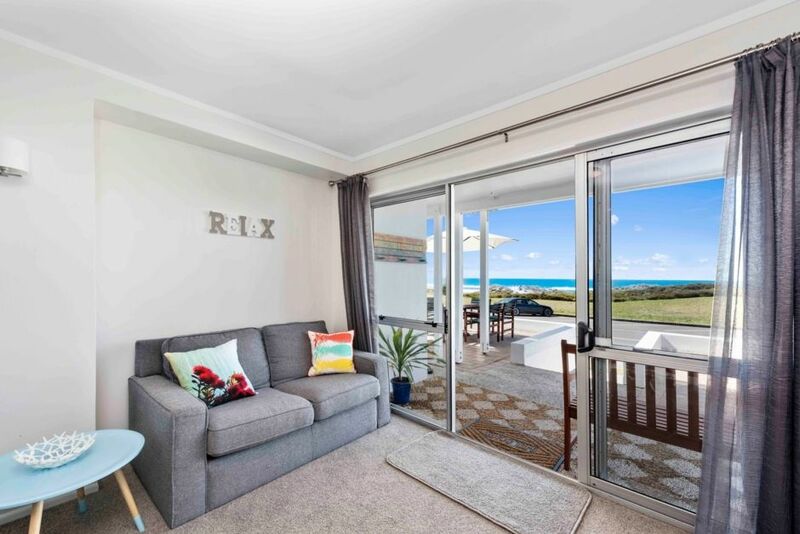 Located across from the beach this small but delightfully and efficiently appointed unit has everything you need. Nicely upgraded and decorated with a fresh beach feel. The unit is a comfortable distance from the hustle and bustle of main beach, with a lovely cafe (Tay) within walking distance. We’ll definitely be back! Location and property is fantastic! It has everything you need, a wonderful place. We stayed for 2 nights at new years eve and had a fantastic time. The apartment is right across the road from maunganui beach, and there's an outside BBQ with table and 6 chairs. The property is well equipped and has modern facilities and appliances throughout. Having the additional satellite tv channels was bonus as well. We got some traffic noise overnight rather than the sound of the sea, but were more than happy with the location. Maunganui town centre with shops/bars/restaurants is a short 5 minute drive, there's also a Countdown supermarket 5 minutes away. Great home close to the ocean. Beautiful sunsets and comfy living. Thankful for all of the extra touches making us feel welcome. Wonderful location. Would love to come back one day! !